I have been served with a CHARGE SHEET (SC/Rule/1/2016) dated 11th Aug 2017 by the Registrar of the Supreme Court on the premise of a complaint made by Vijith Malalgoda J, the former President of the Court of Appeal and now a Judge in the Supreme Court. In view of the said Charge Sheet which apparently has the objective of imposing sanctions on a lawyer who has done his utmost best to restore the rule of law, the independence of the judiciary, to stop intimidation of judges by the Executive I, with due respect submit the following that reveals deliberate suppression of relevant facts concerning a matter which occurred more than 2 ½ years ago and had been dealt with by the former Chief Justice in 2015. 1. The charge sheet refers to a submission made by me before a Bench presided over by the then President of the Court of Appeal Justice V. Malalgoda on 21st of May 2015 requesting to appoint a different Bench, which would not comprise of Justice V Malalgoda to hear the Writ Application No 83/2014. 2. It was not the first time a similar application was made after losing my trust and confidence in Justice V Malalgoda. On 09th Feb 2015, concerning the case CA/Writs/ 65/2015, a motion was submitted to Justice V Malalgoda with a request made to appoint a different bench to hear the case. This motion was also accompanied by the copies of letters dispatched to the Bar Association on 22nd Oct 2014, Commonwealth Secretariat on 31st Oct 2014 and a copy of a press release by the Bar association dated 14th Sep 2014, criticizing the improper appointment of DSG V Malalgoda as the President of the Court of Appeal by the then President Mahinda Rajapakse. Further to this motion a different Bench sans Justice V Malalgoda was appointed to hear the said case. 3. Thereafter, when Writ Application No 83/2014 was called before a bench comprising of Justice V Malalgoda, I was compelled to make another written application by way of a Motion dated 20th May 2015, requesting the appointment of a different Bench sans Justice V Malalgoda since it was the best way to avoid any inconvenience to the President of the Court of Appeal. 4. Justice V Malalgoda declined the said request and called the matter before him and informed me that as the President of the Court of Appeal he would hear the matter by himself at which stage I was compelled to inform that I had lost trust and confidence in him and therefore to appoint a different bench to hear the case. Then, Justice V Malalgoda informed me that he would report the matter to the then Chief Justice K Sripavan with the following remark made on the case record. 5. Thereafter to protect my interests against the unfounded allegations made by Justice V Malalgoda, I kept the Chief Justice informed of the abuse of office by the Justice V Malalgoda with a request accompanied by an affidavit dated 25th May 2015 to transfer the matter (CA/Writ/83/2014) to be heard before a different bench. 6. Further to my submission and the reference made by Justice V Malalgoda to the Chief Justice, the matter was referred to a different bench and the case record was returned to the Court of Appeal Registry with the following minute dated 28th June 2016 made by the Registrar of the Supreme Court addressed to the Registrar of the Court of Appeal. 7. Then after a lapse of more than a year, and also after the appointment of Justice V Malalgoda to the Supreme Court, I was served with this Charge Sheet dated 11th Aug 2017. 8. It is apparent that my uncompromising stance against any person holding any public office including the Judiciary, particularly after steps have been taken to charge several judges, including Justice V Malalgoda and former Chief Justice K Sripavan for judicial corruption has resulted in framing this unfounded allegation against me. 9. 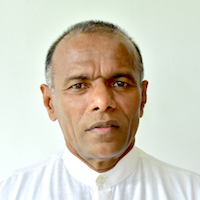 On 15th Feb 2016 I was compelled to charge Justice V Malalgoda for judicial corruption before the Commission to Investigate Allegations of Bribery or Corruption (CIABOC) for abuse of the office of the President of the Court of Appeal to confer favours to the former Executive President Mahinda Rajapaksa. It was apparent by the way the Writ Application CA/Writ/434/2014, challenging the then President Rajapaksa’s nomination for a third term was handled by Justice V Malalgoda. This Writ Application went missing after it was duly filed at the Registry of the Court of Appeal on 15th Dec 2014. However, when the President Rajapaksa was facing a formidable challenge from the opposition Presidential Candidate Maithripala Sirisena the matter was suddenly taken up and listed for support on 2nd Jan 2015 during the Court Vacation. By this time there were numerous requests made by many concerned citizens to withdraw the case since the proceedings with it would have prevented the Presidential Election from being held and ensured the continuation of the Mahinda Rajapaksa regime for a further period of time. This Motion dated 02nd Jan 2015 filed in Court, fully explained the circumstances under which the said Writ Application was withdrawn. Meanwhile the CIABOC has initiated a formal inquiry into my complaint dated 15th Feb 2016 and the recording of my evidence has now been completed. 10. As recognized by the media, intellectuals and the pubic at large the Writ Application (SC/Writs/05/2015) initiated by me in the public interest against the appointment of MPs through the National List has a great National Importance. There is a constitutional fraud collectively committed by all three organs of the government, including 5 judges in the Supreme Court deliberately violating the Article 82 (6) of the Constitution in the year 1988. This serious crime committed against the citizens remained undiscovered for over 28 years until after a voluntary investigation I was able to bring it before the Supreme Court on 13th Oct 2015 seeking justice for the people who have been cheated of their sovereign right of franchise. Therefore, a request was made under Article 132 (3) (iii) of the Constitution to the Chief Justice to appoint a Full Bench of the Court to hear and determine the case within a stipulated period of 2 months as per Article 104 (H) of the Constitution. 11. However, the Chief Justice K Sripavan rejected my request and appointed a normal bench of 3 judges to hear the case with no reasons given for his refusal, whereas he was under duty to exercise the office fairly and reasonably and only for the public good according to the public trust doctrine. 12. As the said matter was initiated purely in the public interest with no pecuniary interests whatsoever, I was compelled to make a further written submission on 26th Nov 2015, requesting the Chief Justice to revoke his decision and to appoint a Full Bench to hear the case which was well within the rights guaranteed under the Constitution. 13. Unfortunately, Chief Justice, in response to my request went on to call for observations from the other judges to suspend me from practice. It came as a complete surprise to me as I had committed no wrong but only acted to protect the interests of the fellow citizens who I represented in the case. 15. As stated above the case against the National List abuse was initiated by me purely in the public interest but owing to the tremendous pressure brought upon me by the Judiciary, 31st July 2017 I was forced to make a request to abate the proceedings, with reasons set out in the Motion field in Court. And I was also compelled to make a request to the Registrar of the Supreme Court to take appropriate steps ensuring that no judge charged for judicial corruption is appointed to hear the cases that I had initiated to protect the interests of the fellow citizens from the criminal elements occupying public offices in the Legislature and the Executive. 16. I submit with due respect that the process adopted to issue a charge sheet on a matter already dealt with (refer to paragraph 6 above) violates the fundamental norms of Administrative Law and the Rule of Law. These are governed by entrenched principles of administrative law, which prohibits, inter alia, decisions that violate the principles of Wednesbury Reasonableness Doctrine, fairness, proportionality, due process, the legitimate expectations, and right to freedom from arbitrary and capricious decision making. 17. 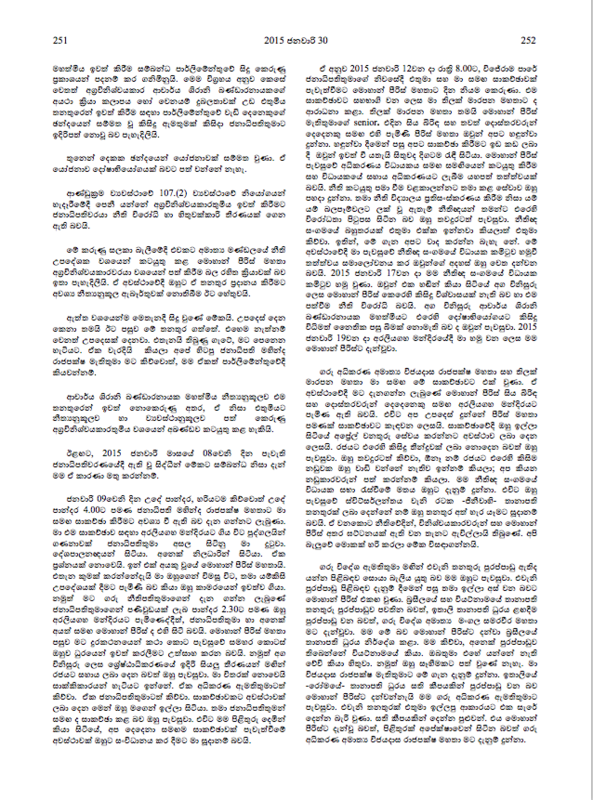 It is submitted that the process adopted in framing the charge sheet sans any form of investigation/inquiry whatsoever carried out on the impugned allegations made by Justice V Malalgoda without adhering to the due process is ultra vires and an illegality, as there has been an excess of jurisdiction which also amounts to violation of the multiple principles of the administrative law. 18. Your Lordship will no doubt agree that the conduct of certain judges in the recent past has brought the judiciary into disrepute resulting in the loss of confidence and trust in the justice system by the people. 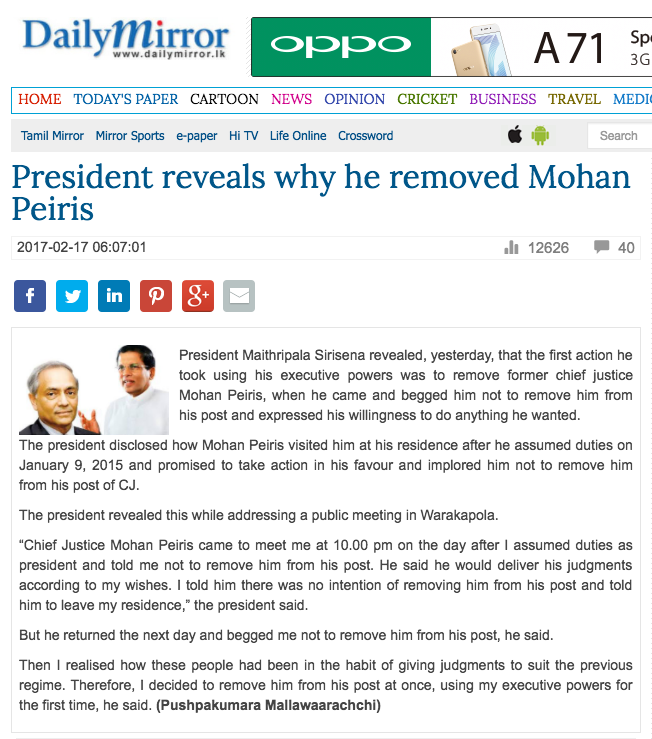 A fitting example is the statement made by the Prime Minister in the Parliament on 30th Jan 2017 about the despicable conduct of the Chief Justice Mohan Pieris who had sought favours to remain in office with promises to make judgments to please the Executive and also to appoint the judges as per the directions of the Executive, the details of which were fully reported in the Parliamentary Hansard dated 30th Jan 2015. Subsequently the Executive President himself reaffirmed this statement referring to the favours sought by the Chief Justice Mohan Peiris. The media gave maximum publicity to this improper, insulting, intolerable and unbecoming behavior of the Chief Justice that patently violated the public trust doctrine. Yet, so far no disciplinary proceedings have been instituted against the lawyer Mohan Pieris. 19. Drawing Your Lordship’s attention with due respect to the Commonwealth Latimer House Principles which have been ratified by the Government of Sri Lanka which is a member in the Commonwealth, I submit to your Lordship that the unfounded allegations and initiation of contemptuous proceedings for legitimate criticism of the performance of the judicial function is not permitted and such proceedings shall not be used under the Clause B of paragraph VII of the Commonwealth Latimer House Principles. 20. Your Lordship’s attention is also drawn to the paragraph 16 and paragraph 23 of the United Nations Basic Principles on the Role of Lawyers adopted in September 1990, where it is specified that Governments shall ensure that lawyers are able to perform all of their professional functions without intimidation, hindrance, harassment or improper interference and shall not suffer, or be threatened with prosecution or sanctions for any actions taken in accordance with recognized professional duties standards and ethics without suffering professional restrictions. 21. Finally, with due respect I request Your Lordship to review the charge leveled against me by taking the content of this submission to consideration in its entirety, before proceeding with the same.